• To take as many people as possible with us. 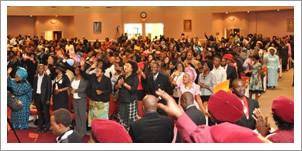 • To have a member of RCCG in every family of all nations. • To accomplish No. 1 above, holiness will be our lifestyle. • To accomplish No. 2 and 3, we will plant churches within five minutes walking distance in every city and town of developing countries and within five minutes driving distance in every city and town of developed countries. • We will pursue these objectives until every Nation in the World is reached for Jesus Christ our Lord. The Care Ministry at RCCG Restoration is a community wide effort to alleviate hunger in our Community. The Care Ministry has been created to coordinate compassion ministry-serving to address spiritual and physical needs of our members. As part of this effort, we provide food and other services without discrimination to eligible families within and outside the church. Care Ministry helps with groceries on a monthly basis. We offer food assistance to our neighborhood every Second Saturday of each month starting from 12pm. This program is the heart and soul of RCCG Restoration Care Ministry, where volunteers come together to work hand-in-hand, helping others in the community get through crisis situations. Care ministry is setup to help anyone in immediate need of assistance. We extend our helping hands to both member of our church and non-members. We are here to offer temporary assistance to our community. How do we decide whom to help? Our assistance is determined upon completion of the short form which takes only 1-2 minutes to complete.